Bambam and Teddy A may have been evicted from the #BBNaija Double Wahala, but their performances in the house have earned them critical acclaim. Mavin Records boss, Don Jazzy on Sunday evening praised the duo as “mad talented” and “ready for the industry”. 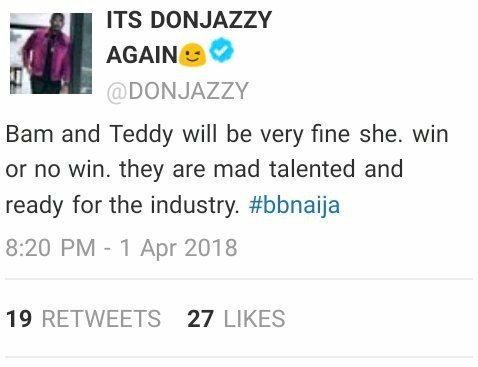 Teddy A had cried on Saturday night when his strategic partner and lover Bambam was evicted. He was also evicted on Sunday night.